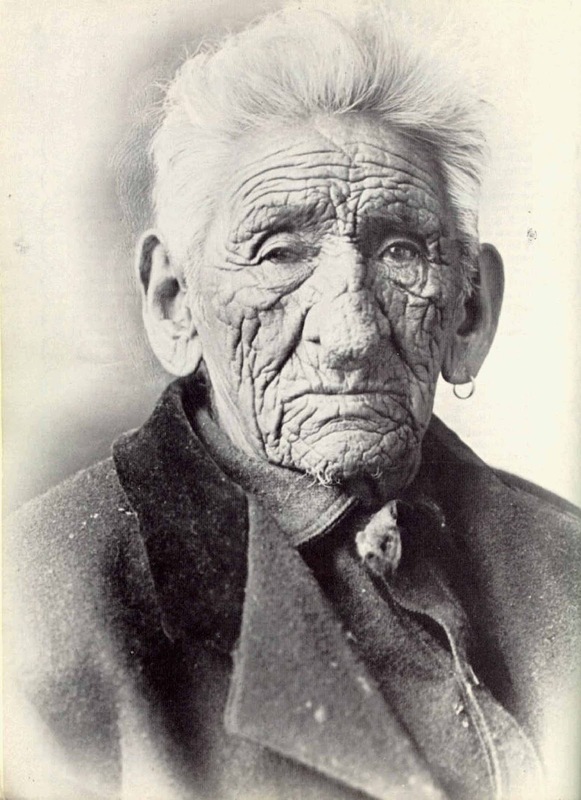 Smith was a Chippewa Indian who lived in the Cass Lake, Minnesota area and is reputed to have died at the age of 138. 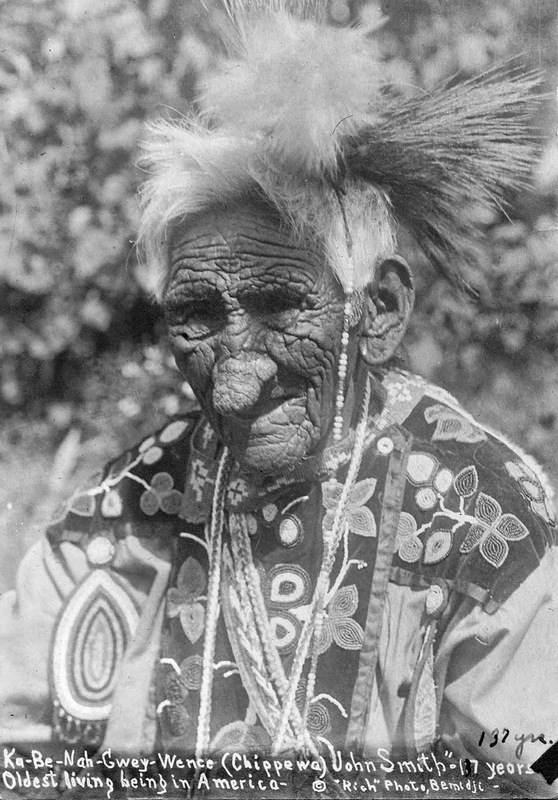 He was known as “The Old Indian” to the white people. 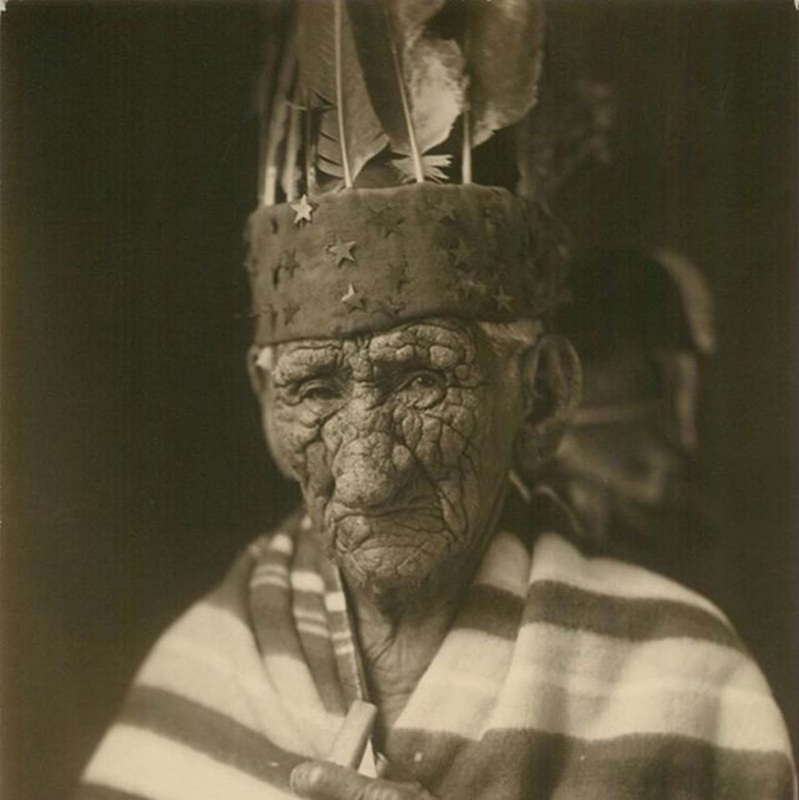 The Minneapolis Morning Tribune obituary says Ga-Be-Nah-Gewn-Wonce (variously known as Kay-bah-nung-we-way, Sloughing Flesh, Wrinkled Meat or plain old — well, really old — John Smith) was reputed to be 138 years old when he died. Whatever his precise age, his well-lined face indicates a man who led a long and full life. He fought, he fished, he counseled, he rode horses and trains, he appeared in moving pictures, he sold postcards. He had eight wives and no children, but an adopted son Tom Smith. 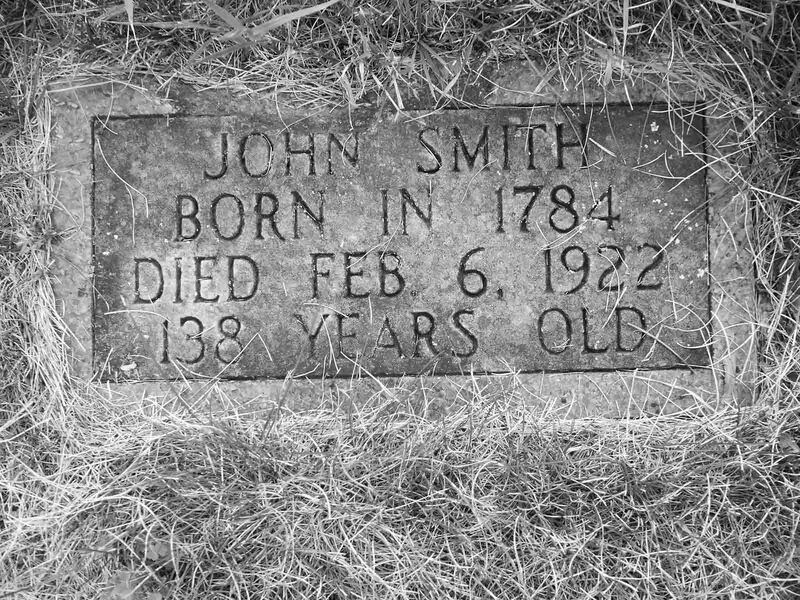 The exact age of John Smith at the time of his death has been a subject of controversy. 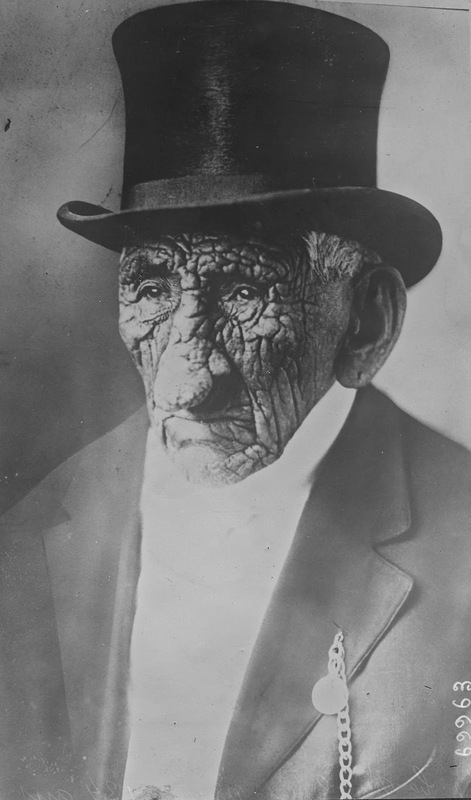 Federal Commissioner of Indian Enrollment Ransom J. Powell argued that “it was disease and not age that made him look the way he did” and remarked that according to records he was only 88 years old. Paul Buffalo who, when a small boy, had met John Smith, said he had repeatedly heard the old man state that he was “seven or eight”, “eight or nine” and “ten years old” when the “stars fell”. The stars falling refers to the Leonid meteor shower of November 13, 1833, about which local historian Carl Zapffe writes: “Birthdates of Indians of the 19th Century had generally been determined by the Government in relation to the awe-inspiring shower of meteorites that burned through the American skies just before dawn on 13 November 1833, scaring the daylights out of civilized and uncivilized peoples alike. Obviously it was the end of the world…”. This puts the age of John Smith at just under 100 years old at the time of his death. 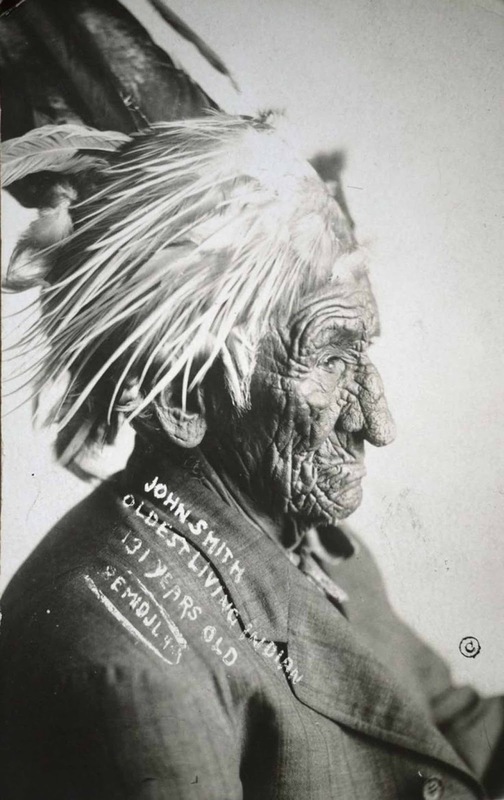 John Smith (Kay-bah-nung-we-way, Sloughing Flesh), commonly known as “Old Wrinkled Meat”. He had eight wives and no children, but an adopted son Tom Smith. The Leonid meteor shower of 1833 was a great way to date people who had no birth records, because it was seen all over the eastern US and was unforgettable to everybody who saw it. “Oldest living being in America”.